Last fall I heard a thought-provoking talk– sponsored by the Casden Institute at USC — by Daniel Mendelsohn, author of THE LOST: Searching for Six of Six Million. Mendelsohn spoke about the “problem of the witness” and as well, “the problem of the historian.” How are those who give testimony about traumatic events affected by their own conscious or unconscious agenda? The testimony in the Yizkor (memory) books, written after the war, are charged by the ragged emotions of the times. One would think the “historian” would be far more objective than the witness. But Mendelsohn revealed how the historian can be tainted by his or her own way of seeing the world. Mendelsohn finally discovered where his great-uncle and his daughter had hidden in their family’s town during the war; he’d actually possessed the crucial clue for the five years of his search. However, he’d misinterpreted a single word all that time. His grandfather spoke of their relatives hiding in a castle. But his grandfather had a Yiddish accent and the word he used was the Yiddish word kesle, a box. A hole in the ground. A bunker. Mendelsohn believed some fairytale about the faraway family hiding in a castle. The truth was much grimmer. I thought of this recently when studying the photo of the house on Rolna Street, the last known address of my relatives in Radomsko. I found this address for my great-aunt Fayge Konardska Wilhelm and her husband Fayvel Wilhelm on a 1939 registration list compiled by the Germans. When I first encountered the house several years ago, my companion noted her surprise at “how big and pretty” it was. I too was surprised; but I liked the idea that my relatives lived in such a big and pretty house. I saw what I wanted to see. I wanted to believe that the house on Rolna Street was where my lost relatives lived a “normal” life: waking up in the morning to go to work, putting the teakettle on the stove, thinking about a picnic on the banks of the river, or a trip across town to visit aged parents. 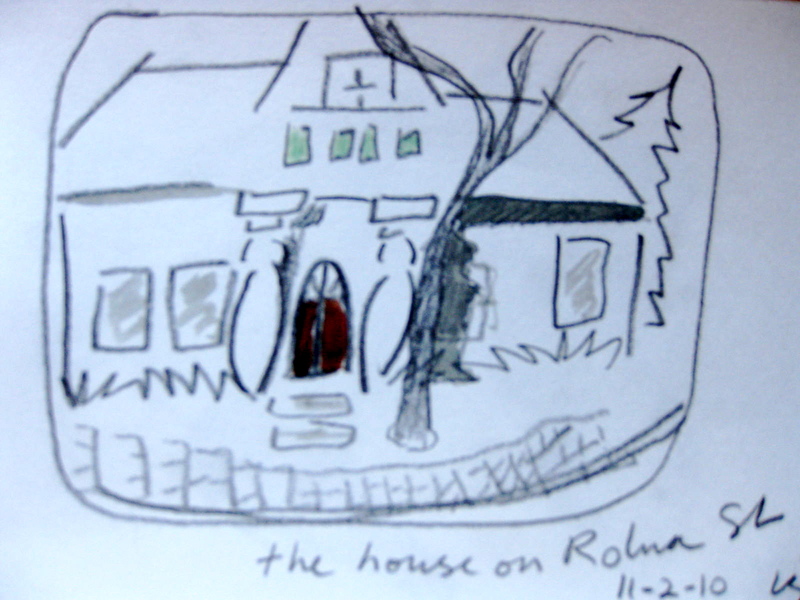 Then, on a writing retreat, I sat down to draw the house on Rolna Street from the photograph, feeling its contours through my pencil. Those two big columns in the front were downright sepulchral. That’s what tipped me off. This was not the house they actually lived in. The Polish occupants of this house were forced to move out when the Germans established the Radomsko ghetto. This house on Rolna was the terrifying limbo where Fayvel and Fayge were incarcerated with other families before deportation to hell. There was another address in Radomsko for the Wilhelms, which my cousin Laura discovered in her mother’s 1935 day book. I’d misplaced it and since it was sent snail mail, it wasn’t in my computer.I took a copy of that handwritten address with me to Radomsko last month, but to my chagrin, nobody there could dicipher the address, even longtime residents. A few weeks ago, in Warsaw, I visited the Muzeum Tekniki at the Palace of Culture, the gargantuan gaudy Soviet high-rise that was Stalin’s unwanted“gift” to the people of Poland. There were rooms of old telephones, washing machines, old uniforms of miners– all untouched since the 70’s What particularly intrigued me was the forensics exhibit. 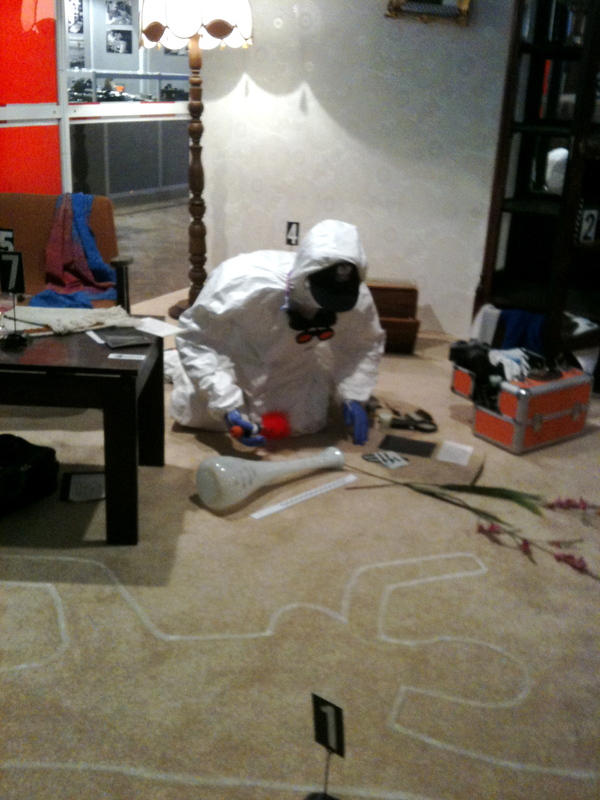 My favorite tableau was this mysterious investigator in the space suit, examining the scene of the crime, frozen forever in the act of collecting evidence. Did what he thought he was going to find influence what he actually saw, and how he saw it? Yes… beyond a reasonable doubt.